Contrary to the contemporary mantra that America was birthed as a secular nation, the historical evidence demonstrates that America was founded by Christians who wished to enjoy the liberty to freely express their Christian faith. Lamentably, Christians have forgotten and neglected the Christian heritage bequeathed to them by America's Founding Fathers and have allowed secularists to disparage and deny what was given to them at such a great price. America's Founding Fathers and the Bible briefly describes a portion of America's Christian heritage, particularly during the rise of nationalism when America was shaping its national government. 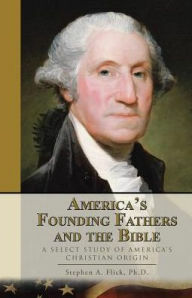 During this era, the Founding Fathers affirmed both the principles and practices of the Bible. By no means exhaustive, this work demonstrates that America's Founding Fathers clearly intended to perpetuate the Christian faith, in both private and public observances. The Founding Fathers left a legacy of publicly honoring the principles of Christianity and fully intended that succeeding generations of Americans should do the same. For further information and some great ministry be sure to visit Stephen Flick at Christian Heritage Fellowship. You may also pick up a copy of America's Founding Fathers and the Bible at Amazon. Contrary to the arguments from the irreligious, America was not founded as a secular nation. Rather, the historical facts demonstrate that from the charters granting immigrants permission to settle in English controlled lands to the first thirteen state constitutions, Christianity was a guiding influence in all of these documents. In addition to a wealth of legal documents demonstrating America's Christian origin and development are the clear historical footprints of the Founding Fathers' mingling of Christian observances with both the state and federal levels of government. It may be demonstrated from the records of the Continental Congress onward that America's Founding Fathers never believed that Christianity should be repressed. In fact, the Continental Congress repeatedly issued proclamations calling for days of fasting and prayer. These proclamations were issued to the states for observance and were observed by General George Washington and the American Revolutionary Army. In addition, the Continental Congress issued thanksgiving proclamations that served as the foundation for the first thanksgiving proclamation under the Constitution. President Washington signed the first thanksgiving proclamation Congress sent to him, and in doing so, began a tradition that was to receive annual observance in the nineteenth century. So deep and strong was the relationship of government to the Christian faith in America that the relationship was recognized in a variety of ways. Few realize that the United States Capitol was used as a church for years before it was used to convene the United States Congress. For nearly three-quarters of a century, the United States Capitol was used for church services. In fact, it became a meeting place for a number of churches in Washington, D. C. While secularists wish to keep this and many other similar historical facts quiet, the sincere Christian will wish to celebrate the spiritual heritage our Founding Fathers have bequeathed to us. Get your copy of When The United States Capitol Was A Church at Amazon. Stephen A. Flick, Ph.D. is founder and executive director of Christian Heritage Fellowship, Inc., a charitable organization conceived to recover America's true Christian origin. He is a graduate of Indiana Wesleyan University, Wesley Biblical Seminary, and Drew University. In addition to serving as a graduate professor of theology and Church history, Dr. Flick has pastored churches, conducted revivals and camp meetings, and has been a guest speaker in various areas of the nation.